Mitti Ke Rang - MKR , a social organisation, working towards the advocacy and empowerment of widows and single women, strives with a mission to ensure that widows, irrespective of their religion, ethnicity, caste, class or nationality, are protected from discrimination and violence and can enjoy all their human rights, as equal and valuable members of society. We also aim to provide educational support programmes for their children. We at MKR, run many projects, one of which is Project - 'Stories Worth Sharing.' Here we share with you a glimpse into what exactly do we aim to achieve through this project and how we intend to implement it. 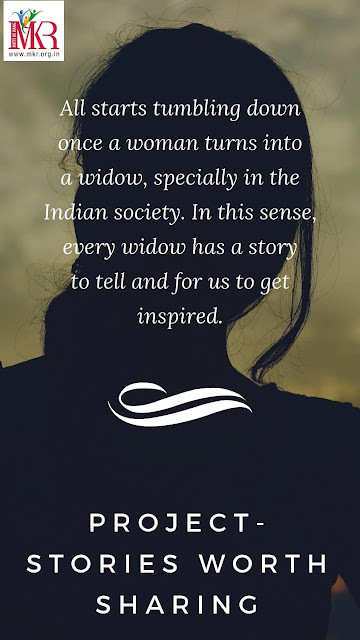 MKR has been working towards improving the lives of widows, towards how we can with our little help bring them one step closer to a better present. Keeping this in mind, we would love to know the real struggles faced by widows before and after their husband's demise. We would like to salute them by sharing their life stories to and for the world to know the courage and bravery these women showed in times of great plight. Hence, the Team MKR has come up with Project 'Stories Worth Sharing', because we believe that behind every widow there is a story worth sharing to get inspired by. Our aim is to ask every intern and every new member who joins MKR, to interview one such brave woman, who in the face of fear showed courage and strength. Also while doing so write their story and put up a joint picture with them. So are you guys ready to be a part of this project ? To know the women who inspired this organisation a step further ? Come on then! Keep following our blog for the Stories that our team will share with you. Vyomi Gidwani, an undergraduate student from St. Mira's College, supporting the MKR team on communications and documentation as an intern. Passionate about Sociology & Literature, she loves engaging in innovative projects that uplifts the lives of society.